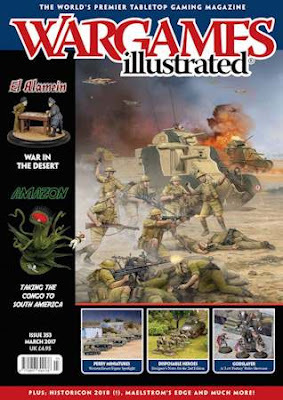 In Wargames Illustrated 353, we have gone big on Flames of War 4th edition, featuring several articles on World War Two in the desert, which is the focus of the new rules. We also use the Western Desert as a vehicle to look at Perry Miniatures' 28mm range for this theater, and the 20mm-based Battlegroup Tobruk rules. We take a selective look at some of the wargaming related releases coming your way in the next few months. Game designer Phil Yates discusses the methodology behind the creation of the new version of Flames Of War. Spiral Arms Studios provide an insight into the creation of their sci-fi universe and the gaming products based within it. A closer look at the new plastic German and British tanks for the Desert War phase of World War Two and how they work in the new version of Flames 4th Edition. Bill Gray takes a trip down memory lane and then ponders the future of Historicon as it changes venue from the heat of Virginia to New Jersey, as of 2018. 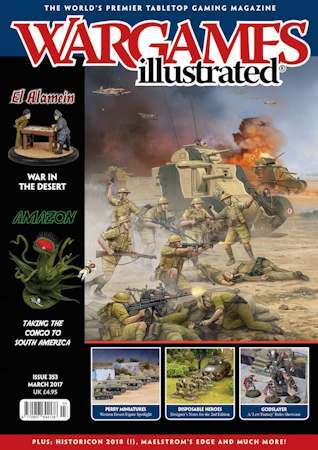 For this month’s theme, we asked Warwick Kinrade to come over with his upcoming Battlegroup: Tobruk supplement and some 20mm models and try out a scenario based upon this defence by NZ troops during the Second Battle of El Alamein. Nick Buxey has managed to find a whole new continent to use the Congo rules within! From the Age of the Conquistadors to the 1920s and beyond, Nick takes us adventuring in and around the Amazon. The release of the new Desert Rats and Afrika Korps books alongside the new version of Flames Of War, has the Battlefront Staff planning and creating new Mid-War Armies for the Desert. Due to be released in April of this year, the second edition of these pseudo-fantasy Bronze Age game caught our eye, so we invited Dave Saunders of Megalith Games to visit and give us a demo of the rules. Those looking to game the Desert war in 28mm could do worse than take a look at the range on offer from the Perry’s. We had a chat with Michael Perry about the range so far and his plans for the future. Barry Hilton presents a follow up to our Raids! theme in WI347, this time with warriors sporting a plethora of lace during the action at Camerat Bay in June 1694. Still have a Version 3 force for Flames Of War rules? Well, Battlefront have thought of that, providing two books and support to update what you have to use in Version 4. Wayne Turner tells us more. Paul Davies explains how to create tents suitable for use at this scale. Henry Hyde explores his personal history of being a wargamer, how that has served to enrich his life and how he has been comforted during difficult times.